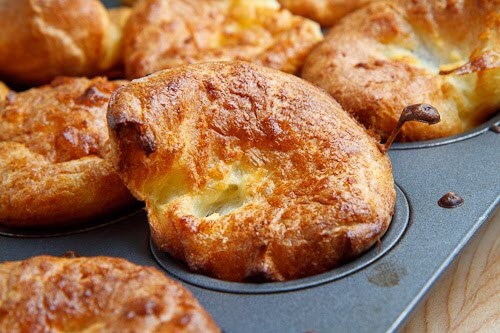 The Brits call them Yorkshire Puddings. In the U.S. we call them Patriotic Popovers. Whatever you call these doughy treats, they partner well with roasted meats and holiday meals. There are dozens of ways to dress up a popover or add ingredients to make them a stand alone meal. I prefer them as a simple doughy treat served as a compliment to a balanced meal. The cooking tips to remember are HOT OVEN and DOOR SHUT. Other than that, popovers are a breeze to make. Open a bottle of red wine and enjoy!